Historians of science concluded that this was an instrument that calculated and illustrated astronomical information, particularly phases of the Moon and planetary motions, in the second century B.C. The researchers, led by the mathematician and filmmaker Tony Freeth and the astronomer Mike G. Edmunds, both of the University of Cardiff, Wales, have reported their results in the journal Nature. They said their findings showed that the inscriptions related to lunar-solar motions, and the gears were a representation of the irregularities of the Moon’s orbital course, as theorized by the astronomer Hipparchos. They established the date of the mechanism at 150-100 B.C. 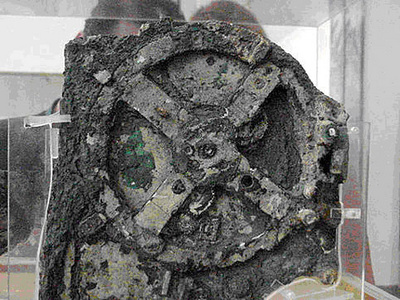 The Roman ship carrying the artefacts sank off the island of Antikythera in about 65 B.C. Some evidence suggests it had sailed from Rhodes. The researchers said that Hipparchos, who lived on Rhodes, might have had a hand in designing the device. Technology historians say the instrument is technically more complex than any known for at least a millennium afterward. Earlier examinations of the instrument, mainly in the 1970s by Derek J. de Solla Price, a Yale historian who died in 1983, led to similar findings, but they were generally disputed or ignored. The hand-operated mechanism presumably used in preparing calendars for planting and harvesting and fixing religious festivals, had at least 30, possibly 37, hand-cut bronze gear wheels, the researchers said. A pin-and-slot device connecting two gear wheels induced variations in the representation of lunar motions according to the Hipparchos model of the Moon’s elliptical orbit around Earth. The numbers of teeth in the gears dictated the functions of the mechanism. The 53-tooth count of certain gears, the team said, was “powerful confirmation of our proposed model of Hipparchos’ lunar theory.” The detailed imaging revealed more than twice the inscriptions recognized earlier. Some of these appeared to relate to planetary and lunar motions. Perhaps, the team said, the mechanism also had gearings to predict the positions of known planets. Dr. Charette noted that more than 1,000 years elapsed before instruments of such complexity are known to have re-emerged. A few artefacts and some Arabic texts suggest that simpler geared calendrical devices had existed, particularly in Baghdad around A.D. 900.